Mesomorph Snowcone at SameDaySupplements.com® for lowest price. APS Mesomorph is the KING of pre-workout powders! Mesomorph, the complete pre-workout powder that is the only product on the market to deliver FULL CLINICAL DOSAGE AMOUNTS of its state-of-the-art ingredient! No fillers and no crash! What's In APS Nutrition Mesomorph 3.0 with Senegalia? How Do I Take APS Nutrition Mesomorph? Assess tolerance: MESOMORPH is a high potency formula that may require a gradual dose increase for some individuals. 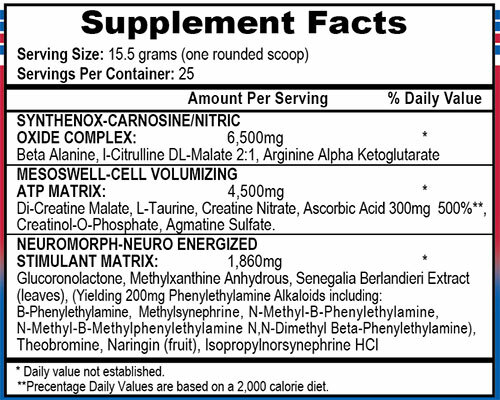 If you are experienced with beta alanine go right to 1 full scoop (MESOMORPH contains 4000g per serving). If you are not experienced with beta alanine start with 1/2 scoop of MESOMORPH. If no tingling or discomfort occurs take 1 full scoop on the next dose and thereafter. If tingling does occur continue 1/2 scoop for 7-10 days then increase to 1 scoop (or as soon as possible). That warm tingle sensation is just Mesomorph at work. Although it can be strong in some, it is not harmful in any way and will subside once body adjusts. Suggested use: After tolerance has been determined 40 minutes prior to workout, mix one scoop of MESOMORPH with 8-10 ounces of water, stir adequately and consume immediately on an empty stomach. On non-workout days, consume 1/2 scoop MESOMORPH mixed in water on an empty stomach. Although you will feel MESOMORPH from day 1, best results begin to occur at day 15 and continue to improve up to day 60. After 8 to 10 weeks, it is recommended that you discontinue use of MESOMORPH and take at least 8 to 10 weeks off before resuming use. During this "off period" you may take a non-creatine product such as PLASMAGEN NITRATE to experience continued progress. As with any supplement, check with your physician prior to use. Do not use this product if you have any current or previous medical condition of any kind. Such conditions may include but are not limited to high or low blood pressure, stroke, arrhythmias or palpitations. Any heart, thyroid, or liver condition. Seizures, anxiety or depression, prostate enlargement or inflammation. Do not use if you are nursing or pregnant. Do not use if you are taking an MAOI. If any adverse symptoms occur discontinue use immediately and consult a physician. Keep out of reach of children. DO NOT take for more than 8-10 weeks without an 8-10 week off period. Before beginning any program of weight loss, consult your health care practitioner. These statements have not been evaluated by the FDA. This product is not intended to diagnose, treat, cure or prevent any disease. We have a large selection of in-stock APS Nutrition products including Pre Workout items and others for the lowest prices at SameDaySupplements.com® It's always easy to shop for Mesomorph Snowcone at SameDaySupplements.com® because you can browse by reviews, brand, prices or search for specific ingredients using our search tool. In-stock orders placed before 3pm EST ship out the same day to USA, Brazil, United Kingdom, Canada, Germany, Australia, Japan, India, France and worldwide at the cheapest prices online.